Four times each year, 100 women gather together from across the southern Puget sound area. Every attendee drops their name in a hat on the way into the room. Four names are randomly drawn and those four women give short presentations about the nonprofit of their choice. After a question and answer session, the group votes and selects one nonprofit that the group will support. At the end, everyone in the room writes the chosen organization’s name on a $100 check, resulting in a large, collective donation to a single organization. The South Sound 100 Women selected Nourish as their nonprofit to support for the first quarter of 2019. “This is meant to be about the power of collective giving in our community.” Stacey Guadnola says. She helped to get the group started here in Tacoma based on models from other cities. The premise of the group is that individual small gifts can be joined together to make a significant, collective impact for one organization at a time. Each individual selects the nonprofit that they want to present to the group. This is a benefit for organizations even if they are not selected as the recipient. Every attendee leaves knowing more about four new organizations who are making a positive change in the community. The collective $10,700 donation to Nourish will have an incredible impact. South Sound 100 Women is always looking for more attendees who want to join. Visit their website for more information. To make a donation to Nourish on your own, visit our Donate page. The day I met Randy, it was his 69th birthday and just like every Thursday, he was at the Edgewood Nourish Food Bank, volunteering. “The older I get the more I want to be a part of the community,” he explained. Ten years ago, on the day he retired, his mother sat him down and asked him what he was going to do with his time now. She reminded him that his father was involved in several civic organizations. She suggested he visit the food bank to see if they needed help. Now, Randy brings his mechanic’s precision to his volunteering. He explained that they serve 60 people every hour at Edgewood. He’s proud of that and makes sure that people know how the process works before they begin. One of the other volunteers had brought a cake for Randy’s birthday. Before I left, Randy made sure I had a piece to take with me. Join Randy and sign up to Volunteer. 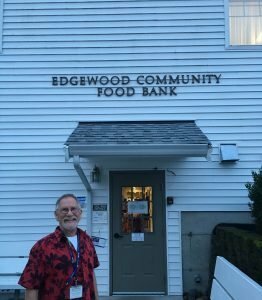 To learn more about the Edgewood Nourish Food Bank, read our “Get to Know a Food Bank” feature on Edgewood. 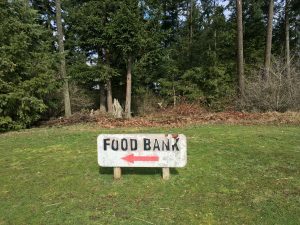 Tucked behind the Holy Disciples Parish building off of 187th in Graham, it might be easy to miss the Graham-South Hill Nourish Food Bank. The food bank has been helping people from this location since 2003. 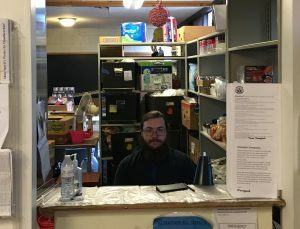 As part of their proposal to purchase the land years ago, the Holy Disciplines Parish committed to establish a food bank on site in addition to their regular offices. Before the food bank settled in at the building owned by the parish, it moved every few years. Vern and Shirley Pierson, long-time parish members, helped to get a food bank started in the Graham area. “This food bank had about four different locations all over the Graham area before we moved in here.” Julie says. In its current location, the food bank has its own building with large refrigerators and freezers, plus a separate storage building. 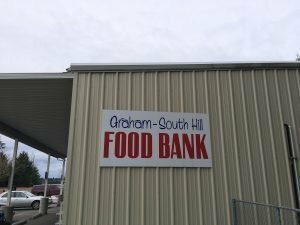 Last year, the Graham-South Hill Nourish Food Bank distributed 794,000 pounds of food to people in need. To support the Graham-South Hill Nourish Food Bank, sign up to volunteer or make a donation. 2018 was a standout year for Nourish Pierce County. 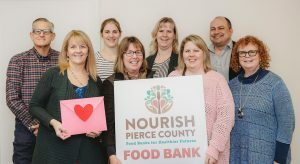 Nourish served 61,000 clients in need, meaning that 7% of the population of Pierce County received food from Nourish in 2018. This is an “unduplicated” number, meaning individuals are only counted once regardless of the number of times they received food from our food banks. On average, clients visited a Nourish food bank six times last year. volunteers contributed more than 83,000 hours of their time last year, equating to roughly 40 full-time staff people. Last year, Nourish improved the way we work so we can better serve the community. We purchased and built out a second mobile food bank truck. With our new truck, we started service at Mary Bridge Children’s Hospital and Cedarcrest Middle School, increasing our mobile food bank sites from 10 to 12 last year. Now, the new mobile food bank is allowing us to partner with community and technical colleges. We have already launched service at many new sites in 2019. Nourish installed a walk-in freezer and refrigerator at our warehouse, which allows us to store more food and be more strategic about bulk donations and food purchases, reducing our costs and improving what we can offer to people in need. We also launched a food recovery program with Costco, thanks to our continued partnership with Food Lifeline. Once each day, we send a refrigerated truck, donated by United Way of Pierce County, to the Tacoma Costco store to collect food that Costco can no longer sell, but is still safe to eat. In the first five weeks alone, we received 30,000 lbs of donated food from Costco, including a large amount of fresh produce, one of our areas of greatest need. This program has expanded what we offer to our clients, helped us spend less on food purchases, and reduced food waste. These are just a few examples of how Nourish improved how we worked in 2018 so that we can better serve people in need in Pierce County. Everything Nourish did last year was the result of the generosity of this incredible community – your donations, gifts, grants, food drives, volunteer hours, and so much more. We are grateful to everyone who supported Nourish. You helped us help the members of our community in need. Thank you!